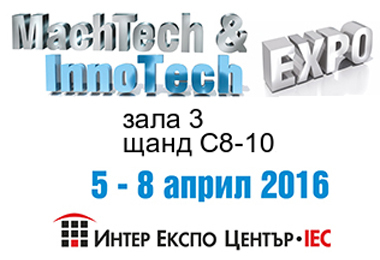 we are pleased to invite you to the 6th edition of the specialized exhibition in the field of industrial machinery and equipment MACHTECH & INNOTECH 2016, in which Kammarton Bulgaria will take part between 5th and 8th April 2016 at Inter Expo Center - Sofia. Welcome to stand C8-10, Hall 3, where we will introduce new trends in the products of our partners and the latest integrated solutions in the field of welding and metalworking. You can get acquainted with the latest offers from the leaders: ESAB, AXXAIR, SIEGMUND, PLYMOVENT, DE-STA-CO, DWT, EXACT, PRYOR, VERNET-Behringer, HERBER.